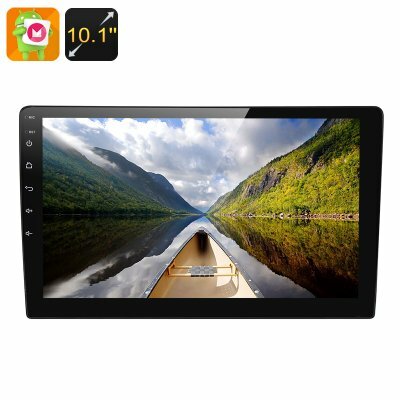 Successfully Added 1 DIN Android 7.1 Car Media Player - 10.1 Inch Display, Touch Screen, GPS, Bluetooth, 3G, Google Play, Quad-Core CPU to your Shopping Cart. Entertain your passengers on the road with this 1DIN car media player and be assured that there will never be a moment of boredom during your upcoming road trips again. With its Android operating system, this car media player comes packed with the latest features the industry has to offer. Watching movies, playing music, hands-free phone calls, and even browsing the web – with this 1 DIN media player your options will be limitless. So head out on the road with confidence, as with this little car upgrade you can be assured that your passengers can enjoy a fun filled trip without exception. Packing a Quad-Core CPU and holding 2GB of RAM this Android media system allows you to smoothly enjoy the latest media, games, and applications alike without dropping a frame. Thanks to its stunning 10.1 Inch display and Mali-400MP graphic’s unit you will be able to enjoy all media in mesmerizing graphics and detail, offering your passengers a true cinematic experience while out on the road. Its Android operating system additionally lets you play games and enjoy the latest mobile applications – brining along tons of entertainment to keep your children or passengers busy while on your way to reach your upcoming holiday destination. Supporting an extremely accurate GPS, this 1 DIN media player can additionally be used as a top class navigation system. Supporting Android maps you will be able to download and insert your own maps, ensuring that no matter where on the globe your next trip will bring you – with this Android car media entertainment system you’ll always be able to find the quickest road to your next destination. With its 3D interface and built-in porcelain antenna, you can be guaranteed that your 10.1 display will show you a highly accurate and detailed image of your current position, ensuring that you’ll never get lost again. With its Bluetooth support, you will be able to easily pair your smartphone with this Android media player, letting you answer phone calls and allowing you to engage in hands-free conversations while in traffic. Additionally, you will be able to sync the media player with your smartphone music library, letting you enjoy your favorite tracks in stunning audio quality. Supporting a 3G dongle, this car media system gives you the opportunity to browse the web at any time. Google Play gives you access to millions of free to download applications, games, movies, and a whole lot more – ensuring that this car entertainment system can offer entertainment fit for anybody’s liking. With 16GB of memory, you can be assured that there will be enough space for all your games, movies, and applications that can now be enjoyed by your passengers at any time. Perfect for entertaining young and old, this car accessory is a great upgrade to your vehicle that is guaranteed to bring along hours worth of fun on the go. This 1 DIN car media player comes with a 12 months warranty, brought to you by the leader in electronic devices as well as wholesale electronic gadgets..
Arabic: - مشغل دي في دي السيارة الروبوت - Chinese Simplified: - 安卓车载 DVD 播放器 - Czech: - Android auto DVD přehrávač - Dutch: - Android auto-DVD-speler - French: - Lecteur DVD de voiture Android - German: - Android Auto DVD-Player - Hebrew: - נגן DVD לרכב אנדרואיד - Hindi: - एंड्रॉयड कार डीवीडी प्लेयर - Hungarian: - Android autós DVD-lejátszó - Italian: - Lettore DVD dell'automobile di androide - Japanese: - Android の車の DVD プレイヤー - Korean: - 안 드 로이드 자동차 DVD 플레이어 - Malay: - Pemain DVD kereta Android - Norwegian Bokmål: - Android bil DVD-spiller - Romanian: - Android auto DVD Player - Russian: - Андроид автомобильный DVD-плеер - Spanish: - Android reproductor de DVD - Thai: - รถหุ่นยนต์ - Turkish: - Android araba DVD oynatıcı - Vietnamese: - Android xe máy DVD.